No one wants to pay more for features that you will never use. The Carson SA-380 has been redesigned into the SA-385 Alert Siren. The Alert siren features all the features you want at a price that is un-beaten. 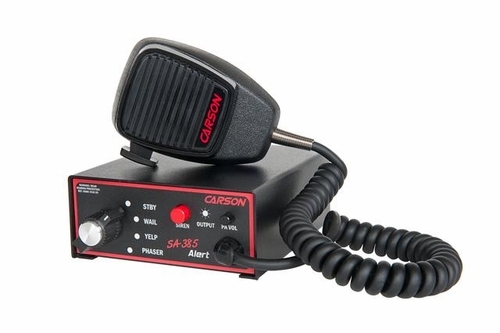 No one but Carson has such a robust, rugged siren at such an economical price. The 380 is for police departments and ems agencies on a budget who want all the most used features of a more expensive siren like PA and a tone selector knob and eliminates all of the other clutter that is not needed. It's great for volunteer firefighters who are active and need a siren with this set of features. The rugged, no-nonsense SA-385 incorporates the same full-featured siren options as its predecessor, the SA-380 Alert, including a four-position rotary switch to select between wail, yelp, and phaser, or optional Two-Tone/HiLo siren tones with Manual and Air Horn override; a P.A. system with noise-canceling microphone and face mounted volume control; an output indicator light on the face for diagnostics; external DIP switches for easy siren customization; Horn Ring Cycler 2 (HRC2) functionality that enables the driver hands-free control of the siren by cycling through the tones with the vehicle's horn; Instant-On; and an exposed in-line fuse to protect the siren. The NEW Alert has also been upgraded with new features designed to enhance siren operation and increase ease of installation. These features include making Instant-On operation a standard requiring no enable input; terminal block wiring which offers simple, plug-in connection; and a significant reduction of the internal electronics footprint giving the SA-385 a much smaller chassis size. Amp Size (cubic inches) 39.25 cu. in. 46.70 cu. in. 49.50 cu. in. 69.00 cu. in. I cant believe how great his siren is in such a small package. You cant beat the price and very easy to install . Very loud and moves the traffic , well worth it . Sorry I waited so long to get it. ConsWish the red button was for a air horn . This siren is great. I have it on my Chevy Monte Carlo. and use it on my personal vehicle. it works great and really moves people out of my way! Great siren at a great price. This is probably the best siren out there. The price is really too cheap like the other guy said because I can't find a siren that does this much anywhere. This siren isn't as big as other police sirens but the sound is even better. the siren puts out like 100 watts. That's the same wattage as any other siren on the market. This thing is priced too cheap. The siren is small but just as loud as a fire truck. It's easy to put in my truck and great. This firefighter siren is a step up from the packages they offer but well worth it.